I have a problem with 99€ buying. In fact since 1 month i can make all the others value buying but the 99€ is locked. I have sent two tickets but no valuable answer and one time, they told me to contact iTunes support. iTunes told me There is no problem in my paiement and it is the application that not permit the buying. 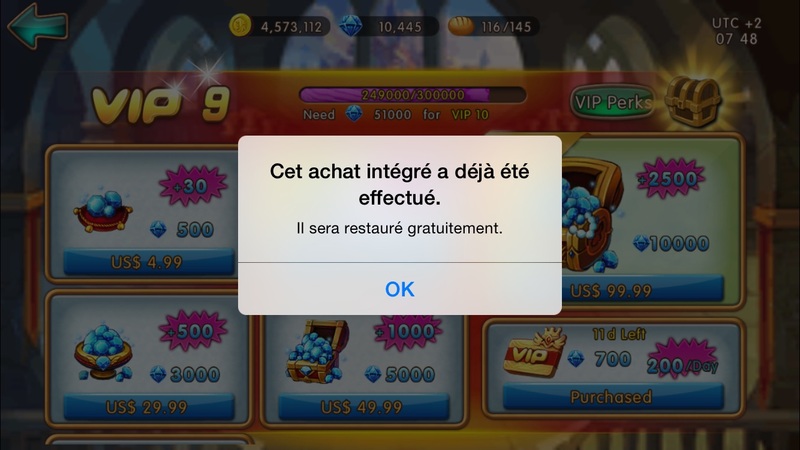 The problem is that when i try to buy, There is a message that told me that the paiement have already done and it will be restaured for Free. I post the screenshot of the problem. iTunes told me that its a problem with the appli that have receive the paiement but is enable to refresh to make another one. I am on Eu27 and Eu29, my char name is Chobozor. Hi, please understand the whole process of the payment is effectuated within the Apple system, we have no right to change anything of it. As our technical team suggested, please ask Apple to check SK Payment Queue of your account. Hope this could help. 2019-4-24 07:00 GMT+8 , Processed in 0.045938 second(s), 38 queries .